This simple but elegant portrait shows a dancing girl holding a fan. 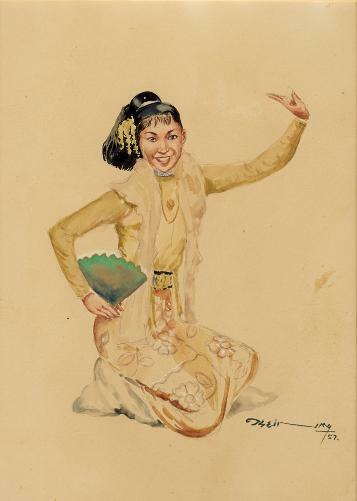 Her costume and jewellery are typically Burmese and she has jasmine flowers in her hair. Little is known about U Thein Maung other than that he was a twentieth century watercolourist who specialised in portraits of Burmese minorities. Most extant examples of his work are dated in the 1950s.